Determine whether the seedlings have developed crowns (pull a plant and feel if ridge between root and top growth which usually develops when plant is 3 to 4 inches tall). All seedlings without crowns and with damaged terminal buds will die. Count remaining plants and keep stand if over 25 plants/square foot. You can drill directly into the hail damaged stand to thicken if needed. Seedlings with crowns and over 6 inches will likely put out new shoots and survive. 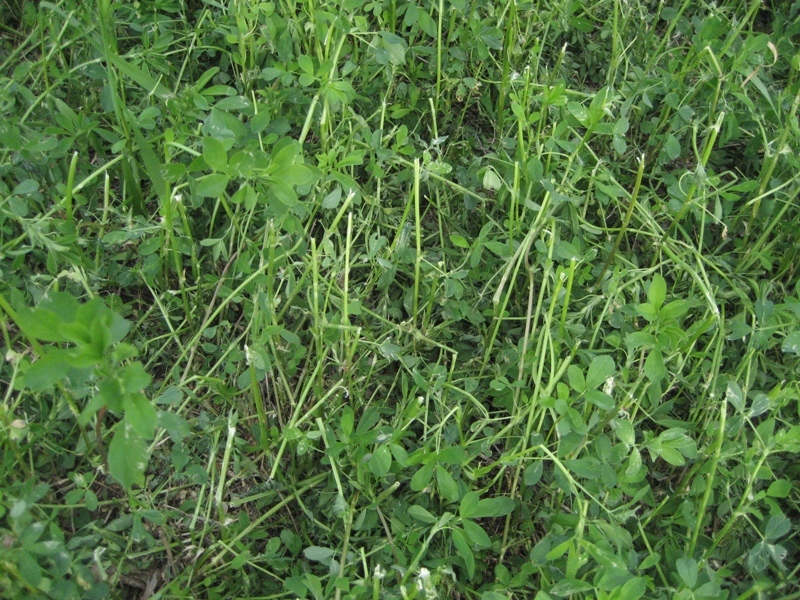 Hail damage of alfalfa and red clover occurs in varying degrees of severity ranging from some terminal bud and leaf damage to completely defoliated plants. Stands may also be lodged by accompanying wind and rain. Alfalfa and red clover grow from the terminal (highest) portions of the plant. If these are damaged growth is stopped on that stem. Thus, hail damage causes loss from physical removal (loss) of forage and from terminated growth, requiring the plant to begin new shoots (stems) for growth. Figure 1. Damage from hail storm. Yield losses from any percentage defoliation will be in relation to the total undamaged yield potential. 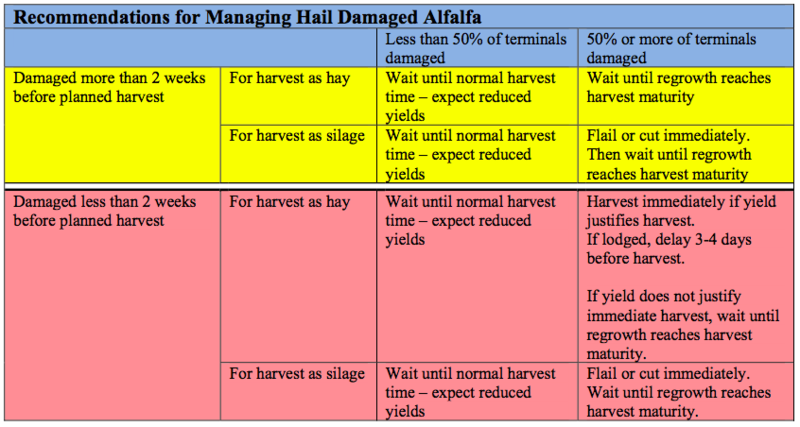 Data collected at UW Marshfield Research Agricultural Station suggest that forage losses for hail damage to first cutting will be approximately 35 lb dry matter per acre for each percentage defoliation occurring within two weeks of harvest for both alfalfa and red clover. These losses occurred where the undamaged yield was 2.25 tons dry matter/a. Hail damage losses for later cuttings are the same for alfalfa and 23 lb dry matter for each percent defoliation of red clover occurring with two weeks of harvest. Actual losses are lower for 2nd or 3rd harvests since undamaged yield will be typically lower for these cuttings. Forage quality losses also occur, since the top and highest quality portions of the plant are removed when hail defoliates a plant. However, these losses are small. Hail damage occurring earlier than two weeks before harvest will generally be to plants short enough so that the crown is exposed to some light. These plants will put out new shoots and produce a hay crop, though somewhat delayed. There is no advantage to cutting or flail chopping the remaining forage unless harvesting. Cutting the residue takes time and fuel and produces no additional yield. When harvesting lodged alfalfa or red clover, our experience has been that disc mowers will pick up more forage than sickle bar mowers. Harvesting against the direction the forage is leaning will allow more to be harvested. With both mower types, tilt the cutter bar or discs forward to increase forage picked up. When using a sicklebar mower one can additionally move the reel forward and down and increase reel speed to help pick up downed forage. Losses and regrowth will be the same as for hay mentioned above. 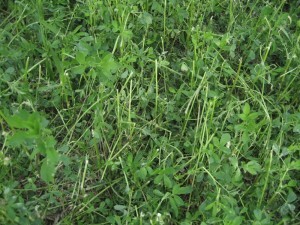 The major difference is that, if alfalfa is to be harvested and fermented (for either baleage or chopped haylage), then it is recommended to flail chop or mow at 4 to 6 inches the stems remaining after hail so that the material cannot mold and affect fermentation of the next harvested crop. Wait 3 to 4 days to allow stand to recover and harvest. Allow stands to mature to normal harvest schedule and harvest. Yield will be reduced but undamaged buds will continue to grow and produce additional yield. Harvest immediately because little additional growth will occur (to the extent that terminal buds have been destroyed) except that coming from new stems which could better be a part of the next regrowth. Wait for stand to regrow from new shoots and harvest when forage at normal harvest height and quality.